How to quit your day job and become a traveling magician. 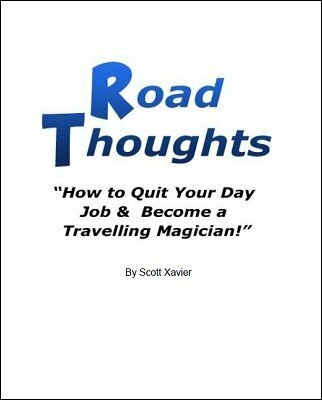 With this new ebook from international touring award winning magician Scott Xavier, you will get top secret venues you can perform at for free and make a living performing magic. You could take the knowledge in this ebook and hit the road today, leaving behind the dramas of a day job, and start your career as a touring magician. This ebook gives you secret locations where you can earn hundreds a night for a 2 hour show! You'll also be able to breeze into town, and with the scripting in this ebook you'll know exactly what to say and to whom to get the show, and how to book it ensure profits! This ebook teaches you how to be a touring Road Warrior! A great way to spend your vacation. Try your hand at becoming a legend. 1st edition 2015, 23 pages.